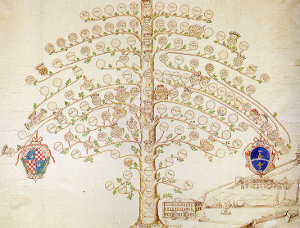 If you search your ancestors in Santa Paolina, Campania, info about your Italian family are stored in the City Office archives or at the parishes. In towns and villages of Campania and in Avellino province registry offices were established in early 1800: it means that you could find information in Santa Paolina registrar as of that date. So, if your ancestors were in Santa Paolina in the nineteenth or twentieth century, then you could try to contact the City Office of Santa Paolina to know more. Before to start your genealogy research in Santa Paolina, we suggest you to read our tips for your search . They are useful to search in Campania and in Santa Paolina too. 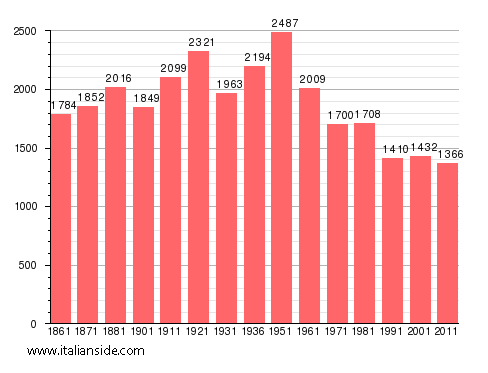 Next picture shows the demographic trends in Santa Paolina from the Italian Unification (1861) an important info to understand how many people lived there in the past. It could be important to know if the last name you are investigating is a frequent surname in Santa Paolina. As more your surname is common in Santa Paolina, as more it could be difficult to find the right info about your ancestors in Santa Paolina archives if you have not exact dates. If you have the opportunity to visit Santa Paolina and Avellino province, you could plan to investigate churches’ archives by yourself, but from abroad is very difficult to obtain any result unless you find a reliable local help. If your research is in a dead end and you need professional help from our local Italian genealogists write to santapaolina@italianside.com our expert in Santa Paolina area will study your request and will reply to you with a research plan and a quote. Please tell me if you have any records of Anthony Cecere or Maria Musto, my great grandparents. My maternal Grandmother , born somewhere around 1870, was a Spinelli. From what I understand, the family was in the chicken business which the brothers carried on in the US. I also believe they were originally from Florence in the 14 r 15th centuries. Carlo or Carmine Champi born 1/27/1864 and Marianna Champi born 9/8/1873 are my grandparents. They came to the US in 1903. I have no records of their parents. Any help would be appreciated. My grandfather Carlo Aufiero came to the USA in about 1894 from Santa Paolina. He sold fruit and vegetables in Newport, RI. His brother’s name was Antonio and his father’s name was Pasquale Aufiero. Any information would be most appreciated. Hello – My grandfather emigrated to America in the early 1900’s from Santa Paolina when he was young. Attillio DeMarzo. He had some brothers and a sister who probably didn’t travel at the same time (unknown names). When I visited in 2014, I was introduced to a lady who was married to a doctor in town, who was a DeMarzo. Can you help? Thanks. I am looking for any family records regarding Emanuele Longo/Luongo born around 1872. Any help would be great. If you would like to start a research in Santa Paolina please send your request to santapaolina@italianside.com.